With the holiday season seeming to be hopping into full swing already this year it's the perfect time to think about home safety. For many families Thanksgiving and Christmas means trips out of town to visit family and friends. And that means leaving their homes empty and vulnerable to intruders. It's not something anyone likes to think would ever happen to them, but the reality is in the present day it's a fact of life. And sadly it seems like break-ins and theft are becoming more and more common. Not everyone has the big bucks to spend on high dollar security systems and protection, but that doesn't mean you can't still protect yourself. For us that meant going with a few products from the EZVIZ line. First off we got the EZVIZ Husky and installed it outside of our house. (Sorry not going to show you where because we did a good job of hiding it.) With the Husky we can monitor and be notified if someone is outside of our house any time day or night. I love this because now my teenage son can't claim he was home on time if he really wasn't - mom now knows better! Secondly we got the EZVIZ Mini Plus for inside of the house. As I'm sure you all know there's always that chance that your outside camera may miss something, and it can't cover every square inch all the way around the house. So having a back-up plan inside is always a good solution. It's small enough you can hide it pretty much anywhere and it will go unseen. And with motion alerts you'll know the moment anyone enters the viewing range of the camera. This is also nice if you have teenagers that want to try sneaking out. My son wasn't trying to sneak out, but I sure did catch him off guard when he was getting a late night snack from the fridge. I talked to him through the two-way mic and scared him stiff! Well, at least I know it works right? 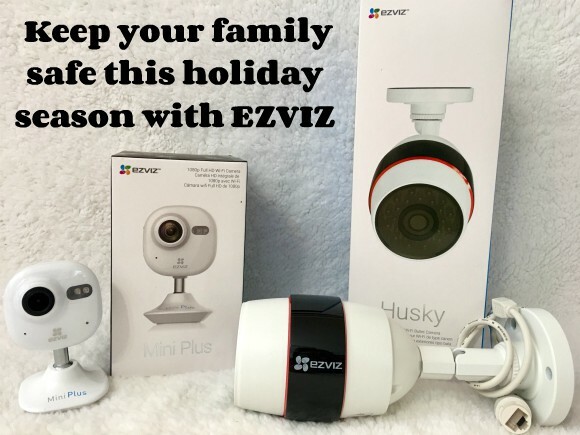 EZVIZ Mini Plus is a compact indoor camera and can mount almost anywhere with its optional magnet base. The camera offers a 135-degree viewing angle and two-way audio that lets customers talk to people back at home. EZVIZ Husky offers wide-angle video recording with an IP66 rating. Suitable for outdoors, the camera is dustproof, waterproof and can handle a wide range of temperatures. With a built-in IR sensor, the camera can see objects in the dark up to 100 feet away. We do have an outside system. Unlike most we dont hide it. In our state you actually have to post you are running a system. It is pretty obvious though especially at night as it picks up in infrared- the lights shine red. We do not have one inside our home, I have went back and forth on that one and we may do it eventually. I like that this is suitable for outdoors, too. I've been wanting an exterior camera on my home. I've been thinking of getting a home camera. Mostly because I want to spy on my cats. This would be great to have around our farm.